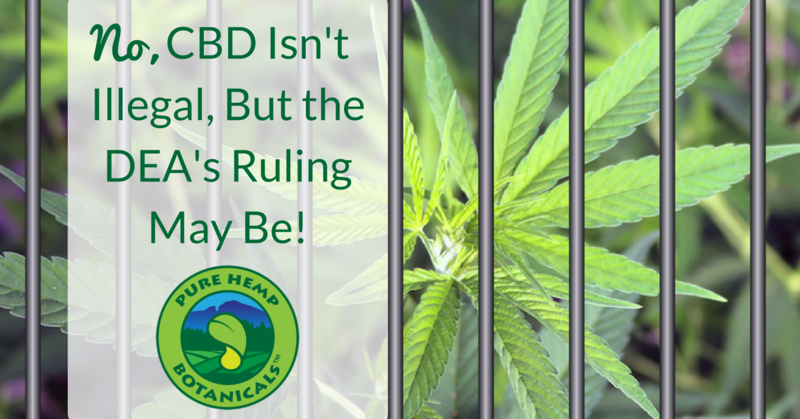 No, CBD Isn’t Illegal, But the DEA’s Ruling May Be! Home/Uncategorized/No, CBD Isn’t Illegal, But the DEA’s Ruling May Be! The DEA issued a statement last week that threw our beloved community into a flurry of worry, shock and disappointment. Hundreds of thousands of people around the country shared how they rely on these gently effective, non-psychoactive CBD products to manage their pain, inflammation, seizures, and other medical conditions. The only reason they are not medical refugees is because they have had legal access in their home states, so any threat to that is more than an inconvenience – the DEA threatens to break up families, to throw people with serious illness into the turmoil of deciding between relocation, breaking the law or the degradation of their health. Understandably, many people reached out with concern, wondering if they will be able to continue legally purchasing our safe, lab-tested hemp oil products. We’re sharing this article to put your worries to rest, and to assure you that we are still committed to continuing to provide you with legal, high-quality hemp oil. So, if you’re like many people, your next question will be: “If the DEA said all that, why are you still allowed to sell hemp?” Simple: the DEA does not have any law-making authority. Their decision essentially changes how they file their paperwork, but does not change actual legality- that’s waaay outside their authority to do. That’s something Congress has authority over, not the DEA. In fact, this isn’t the first time they’ve tried to do this. They tried to make a similar unlawful move over 10 years ago, but had their case completely rejected as unlawful (the case is called “HIA vs. DEA”). From our understanding so far, their current case has even less to stand on this time around. What’s keeping hemp (and me!) safe from the DEA right now? First, you should know that according to Hoban Law and Leafly’s article, there are two prominent safeguards in place protecting people who currently purchase and use CBD products. The first is the Rhorabacher-Farr amendment, which prohibits the Justice Department (of which the DEA is a part) from interfering in any way with state medical marijuana laws and regulatory systems. CBD products fall under the protections of that amendment. This includes CBD-only states which allow patients to possess cannabidiol oil but not regular cannabis. So the DEA may consider CBD oil illegal, but they stress that the agency can’t enforce that opinion in any of the 28 medical marijuana states (plus the District of Columbia), or any of the 16 CBD-only states. The second protection they mentioned is the 2014 Farm Act, which carved out an exemption to the Controlled Substances Act for states engaging in hemp cultivation pilot projects, and defines hemp as a separate entity from medical cannabis. Would you like to learn more about the specifics of how the hemp industry won against the DEA last time, and get more details about where we’re at now? Read the full article here!